I also apologize to all email correspondents who have not received the reply they deserve. The cause of this shortcoming is my single-minded devotion to the writing of Resistance, Revolution, Liberation for the past six months. This required setting aside most of my other duties, and the task has completely exhausted my mental, emotional and physical resources. This is a peculiarly unsympathetic state of affairs, for the world is awash in books--hundreds of thousands of new ones enter the market every year. The world certainly does not need another book, and so anyone idiotic enough to derange himself with the writing of one has little grounds for sympathy. All such works are tossed on the seas of Fate. Most sink into the inky depths without a trace. Everyone who undertakes the task knows this, and so our resulting depression looks like nothing more than whining: after all, what did you expect? 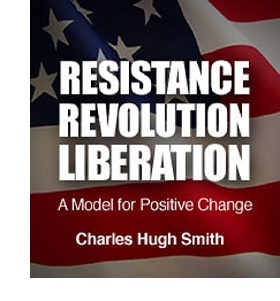 Every writer writes the book he/she wants to read, and this is certainly true ofResistance, Revolution, Liberation: A Model for Positive Change. But any such analysis of the sociopathologies that constantly grind down our well-being and equilibrium can only be understood if the reader has sufficient inner space, time and emotional resources to devote to the task of understanding novel ideas. It’s easy to confuse faith and political ideology. We resist changing our understanding, as we experience this transition as instability and insecurity. But changing our minds does not require changing our faith; rather, the firmness of our faith--in our Creator, in truth, in our ability to help others and prevail--is the bedrock that gives us the discipline and resolve to confront the brutally unwelcome facts of our circumstances and make coherent plans accordingly.